Yes Katinka graduated. It is true. She graduated on Thursday, December 15, 2011. 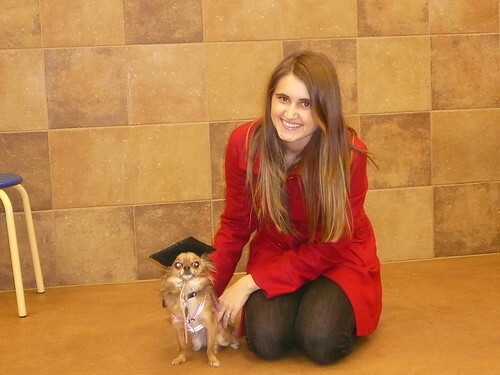 She graduated from Petsmart's Beginner Training Classes. 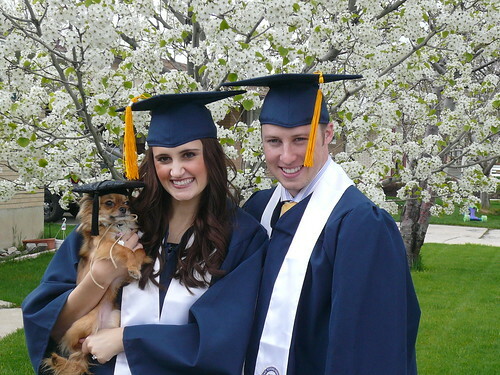 And she even has her own graduation cap to prove it, well, my mother-in-law bought it for her when Kevin and I graduated from BYU this April of 2011. Isn't it the cutest thing? It sure came in handy for her graduation at Petsmart. "Oh, well...actually I have one..."
We still have lots of things to work on but Katinka made BIG progress in the class so that was great! When she first came into the class she would hide under the chair I was sitting on, refuse ALL dog treats, and was too scared to approach other dogs or people. Then I gave her lots of treats when she sniffed other dogs and people and I had people give her treats too when she approached them! By the end of the classes she was trying to play with all dogs even the largest ones! I'm glad she faced her "scaredy-cat" fear! "Kill it" when playing with a stuffed animal. She will then shake it like crazy lol. Ringing the bell when she needs to go to the bathroom. She actually is doing pretty good. I say "Wanna go potty?" and she'll ring it but we still need to work on the connection a little more! She will be in a boarding kennel for this week as we will be in Kansas City for Christmas time! I hope she does well! She will be playing with LOTS of little dogs all day there, so I hope she will become best friends and not be too scared to play with them! Socialization was a big part of the reason I wanted her to get in classes! We'll see I guess! What is a cool trick your dog or pet knows that I should teach Katinka? PS. Today is the LAST day to enter to win this gorgeous cowl/eternity scarf sponsored by A Girl Named Leney on my blog! Hurry hurry! You have until midnight MST and winner will be announced tomorrow! GO HERE to enter! PPS. 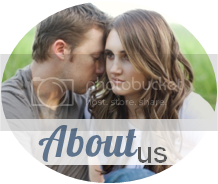 Take a look at Mia's blog, Color it Mia HERE because I'm guest posting on Why I think Mormons Marry Young! I'm sure you all want to read it ;) So check it out! We recently taught diesel to play dead. We point a "gun" at him and say "Bang" and he falls to the floor with his stomach up. Another thing that we love, is that Diesel has to wait for his food. So we pour it into his bowl and he has to wait until we say "eat" to eat it. That helps with them understanding to look to you for how they should act. But yay for Katinka! Sounds like she's doing awesome. seriously that's too cute! she is adorable. congrats Lady K on your graduation! Our red heeler, Rebel, can do something I've never seen another dog do but it certainly not something we trained him to do. He can jump & clear eight-foot privacy fences. He can also climb to the top of them and scale them like a cat. It is quite remarkable and even more annoying. He used to jump over into my neighbor's yard (which thank goodness was my Grandma) and go in her doggy door! He is a hot mess sometimes! Katinka is super cute in her graduation hat! Congrats tiny pup!! This is seriously so cute. Your dog is so freakin' cute. That is SO CUTE that she has her own cap. I could die. I bet it was so funny telling the trainer she already had one, HA! We teach our dog to play dead when we shoot him with our finger- that's my fave! That's awesome with the bell. I would love to have my dog do that! Hi lovely...guest what?! You're my pink wreath giveaway winner! Congrats and I'll be sending you an e-mail to get your addy! Love that your doggy is being trained...she sounds adorable! Congrats on her graduation! How long was the class? And how old is Katinka? HOW cute! Love the little graduation cap! haha! I really enjoyed your guest post on why Mormons marry young! Great work! this is so adorable. my parents did the same thing for their dog when they got her a couple years ago. Congrats to Katinka! My new pup just started her PetSmart classes! I need to be better at commenting! I love Katinka and her hat!! Haha I love this! Absolutely adorable!! !